Mangaia is situated 22 deg South 158 Deg West and has a circumference of about 30 Km. It does not exactly look like what many imagine a south sea island should look. It is not high and covered with rain forest, nor is it an atoll with a lagoon in the middle. But there are of course beaches and coconut trees. 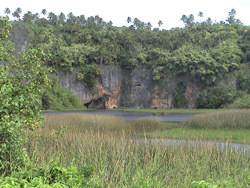 The outer rim of the island consists of ancient coral "Makatea". It is believed to have risen up from the ocean in stages during the last 2 million years and in the process formed terraces. The erosion of this old limestone has resulted in remarkable rock formations and numerous caves hundreds of metres in length or more, some of them below sea level. From the highest point in the middle on the island "Rangimotia" (169m above sea level) ridges covered with pine forest spread out radially. Between the ridges are valleys. Their lower parts are used for agriculture. 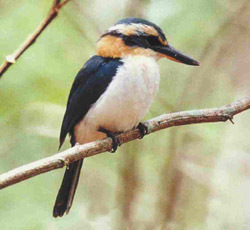 There is a species of bird the "Tangaeo", (Mangaia Kingfisher) which only lives on Mangaia. The lagoon is rich in colourful tropical fish. A visitor was able to identify 25 different species of fish in less than an hour. 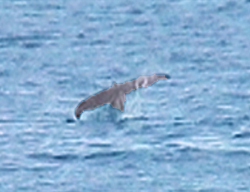 Migrating whales swim past just outside the reef during late June to mid October. 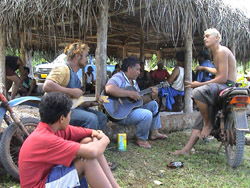 Mangaia's population, about 500 Polynesians living in 3 separate villages, has its own unique language. It is part of the East Polynesian group of languages and similar to the language of Rarotonga. The island's name is pronounced "Mahng-aia" and (not "Man-gaia"; there is no g-sound in Polynesian languages). On the 10th of August 1974 I, a Swede born and bred in Gothenburg, married a South Pacific Islander and in April 1997 we realised an old dream; to build a hotel on her home island. 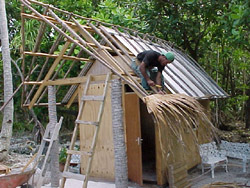 It is called Ara Moana Bungalows and is located on the eastern coast of Mangaia just a five-minute walk south of the beautiful village of Ivirua. 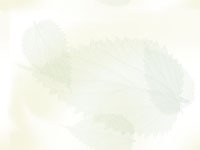 We are still very small which gives us the opportunity to give personal service to our guests. 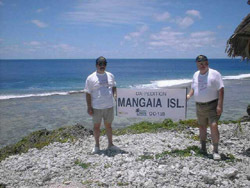 Mangaia is known as OC159 among "Islands On The Air" a society of radio amateurs specialising in making contacts with islands. Only a small percentage of them have ever had contact with Mangaia. Provision will be made to accommodate the special needs of Radio Amateurs. 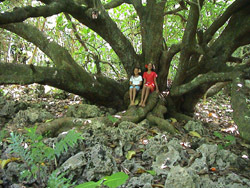 For a detailed account of travel in Mangaia in 1997 see Mangaia - A Personal Memoir.